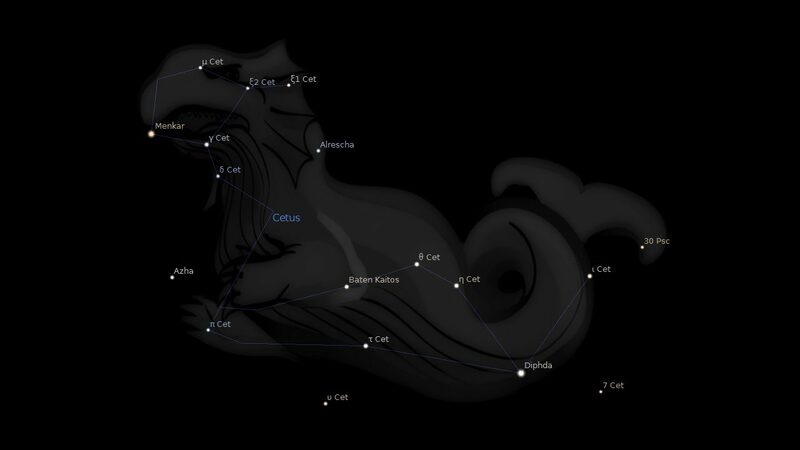 Fixed Star Baten Kaitos, Zeta Ceti, is a 3.9 magnitude yellowish star in the Whale, or Sea Monster, Cetus Constellation. The traditional name Baten Kaitos comes from the Arabic بطن قيتوس (batn qaytus) which means the belly of the sea monster. 1. Star Names, Their Lore and Meaning, Richard Hinckley Allen, 1889. 2. Fixed Stars and Constellations in Astrology, Vivian E. Robson, 1923, p.38, 145. 3. Fixed Stars and Their Interpretation, Elsbeth Ebertin, 1971, p.3. 4. The Living Stars, Dr. Eric Morse, 1988, p.123. 5. Fixed Stars and Judicial Astrology, George Noonan, 1990, p.57. 6. The Fixed Star Health and Behavior Imbalance, Ted George and Barbara Parker, 1985, p.12. wow…This star sounds far from being positive “It gives compulsory transportation, change or emigration, misfortune by force or accident, shipwreck but also rescue, falls and blows” … what can I expect from it if my MC is at 22.12 Aries ? Would it be activated by Uranus on transit 3 times or I would feel it all the time on matters related to my MC? It will always influence your natal chart but be felt stronger during transits to your MC. I have it on my Saturn and I have never lived in the one house for longer than 7 years. You may feel it more in changing jobs or even what you want to do for a living. Am I wrong if I expect to feel it around the 10th Oct as Uranus will conjunt it? when will be the end of this transit? As for jobs…I had some compulsory changes due to the last global financial crisis which at the end encourage me to launch something on my own which is related to my profession but it’s not completely what I want to do for a living in the long term… not easy…lot of blows to direct my career where I want to do as a living. Not the end Meli because Uranus is retrograde at the moment. I was expecting instability in my living arrangements with my Saturn here. But it is looking like Uranus direct will bring one really big change, so maybe you can expect the same with you. One final definitive move around the time of Uranus direct on your MC. Remember your natal aspects making grand trine to MC also being transited by Uranus. MC trine North Node trine Vertex. ​I keep that in mind but still haven’t see who it helps!! I think the eclipse in February is at 2 degrees from north node ….so my understanding is that the trine will be trigger again as well as when transiting saturn hits the vertex ….I am really wondering how this trine will play!! Many many thanks for taking the time to clarify for me so many things about this star and uranus conjunct my MC! The eclipse plus Saturn should materialize something so you can see how this grand trine works. Surely it must be through relationships that is plays out, helping or involving you career or spiritual calling. Work may be different from you calling in this case, for the time being anyway. Let’s take it as easy as we can then !!! Should I understand Uranus conjunct MC as a trigger for changes on the career side or house & family (IC matters) or both? Uranus rules my DC so should I understand that is something related to DC matters? Now, if I recall the first hit (21 May): There were manyy changes and transportation and everything was up and down on both MC and IC matters. There were also obstacles and delays (but I think mercury was retrograde …or just waking up !) Things were particularly more related to housing and friendship mattters although behing that there was an on going family member’s illness. As for the 10 Oct I was thinking to travel b sea around that date but right now taking into account the meaning of this star I am not so sure about it! Could the events happening on 21 May, 10 Oct and 13 Mar be somehow related (similar to eclipses each hit gives a part of the whole change)? I will definitel note these dates on m agenda and keep you posted!! Jamie, Again, always something interesting and yet frightening to read on your site. Its weird how I find articles when I least expect it. My Dad born 6th April 1933, Nottingham, UK has Uranus at 22 degrees, Saturn stands still on his birthday and even more weird is that on April 14th 2017 my 18.6 year nodes starts at 27 Leo on my MC/Pluto exact. In April 1980 I lost my Lovely Granddad, 27 Leo node, in November 1998 I took my lovely brand elderly new father in law into our home so that he could die at home 27 Leo node again, so I really am expecting Dad to go quickly & for the last few months I have been trying to understand the nodes and as a sceptic I have been completely astounded only this week when I looked up the tables. Thank you for the articles. I have Baten Kaitos on my Descendant 20°03′ Aries, and Foramen on my Ascendant 20°03′ Libra, and perhaps Spica with extended orb. Not really sure what they mean, perhaps a combination of the good and bad influence? Omg, I’m was born with the sun in Aries at 21’57”. Yes, I emigrated compulsively, in 2000. Yes, I have a loss of hearing in the right ear… now that I think about it, an acupuncturist I saw for a while, mentioned energy imbalance. Amazing! What else is there to know about it!? Thank you. My Rahu is at 20 degrees Aries in the 11th house does this stay have an affect on it? How would Baten Kaitos aspect the moon at 23 degrees Aries, with a grand fire trine to pluto at 22 Leo,, and Mars, at 24 Sagittarius, I’m wondering? 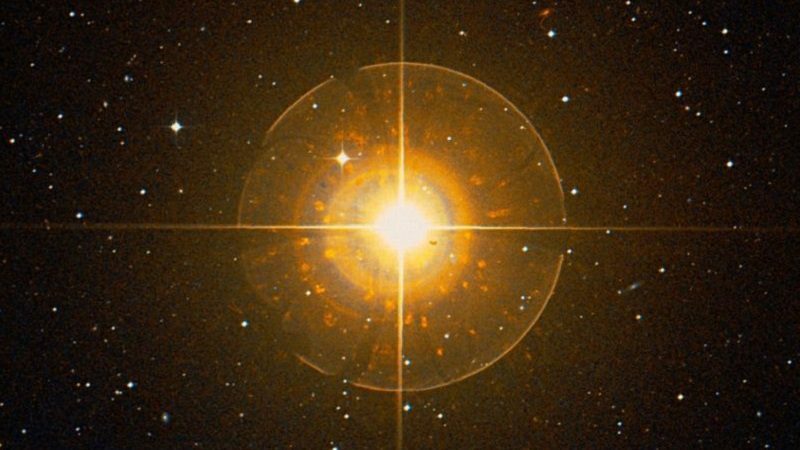 I suppose the effects of this star would apply to your maternal ancestry. See natal Moon trine Mars and the others aspects of your grand trine. Jonah, how interesting, Matthew 12:41’42 applies, but I could not see the Jonah connection, thank you for this information.